Find out more about Apple’s one-year app development curriculum, which will be taught at community colleges and available on iBooks. Instagram, Snapchat, Seamless, Facebook...those are just a few of the apps that have completely transformed our lives. And the act of developing those apps also changed the founders' lives — sometimes to the tune of millions of dollars. But when we think about the most successful app developers, a lot of them seem to fit a similar mold: white, male, and educated at prestigious universities. According to Apple, of the 2 million jobs they support across the 50 states, app development counts for 1.5 million (AKA a huge portion). That's why they want to make the ability to develop apps something that's not confined to startup offices and Harvard dorms. 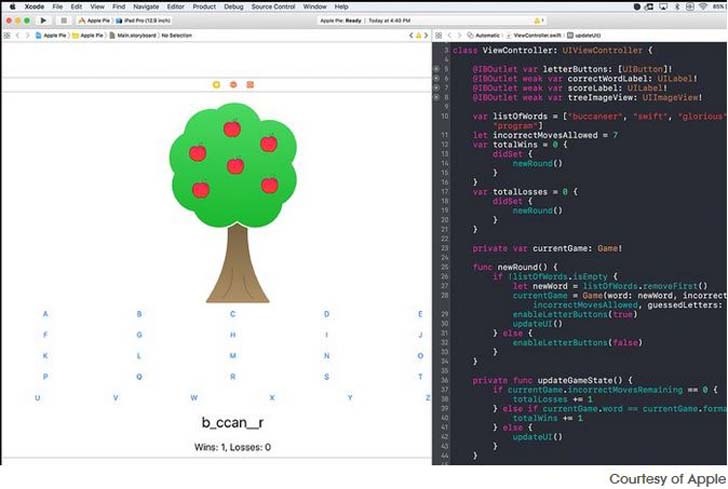 [post_ads]On Wednesday, Apple announced a new initiative in their endeavor to give everyone access to the ability to code and develop apps. Now in the iBooks store, you can get an entire one-year curriculum for learning to develop an app at any age, written by the experts at Apple for their coding language Swift (which you may know from the Swift Playgrounds app). And it won't only be available for you to self-teach the skills — which are available for free for people from kindergarten age through college — Apple has also partnered with six community college systems across the country that will be teaching the App Development With Swift curriculum in classes. The new program is an extension of the Everyone Can Code project that Apple is spearheading in order to bring the skills and code literacy necessary for the fast-growing app development job market to everyone, regardless of age, race, socioeconomic status, or gender. If you're looking to learn a new skill while staying close to home, Apple's new curriculum will be taught at Houston College System, Alabama Community College System, Columbus State Community College, Harrisburg Area Community College, Mesa Community College, and San Mateo Community College District — as well as high schools across the country starting this fall. “We’ve seen firsthand the impact that coding has on individuals and the US economy as a whole. The app economy and software development are among the fastest-growing job sectors in America and we’re thrilled to be providing educators and students with the tools to learn coding,” said Tim Cook, Apple’s CEO, in a statement. “Community colleges play a critical role in helping students achieve their dreams, and we hope these courses will open doors for people of all ages and backgrounds to pursue what they love.”So if you've always dreamed of creating the next Snapchat (or an even more wildly successful app), now's your chance to learn how. Maybe we'll even see you at a future WWDC.